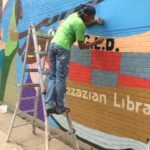 The first painted mural on a Chicago Public Library was almost lost to sun, wind, rain and age. 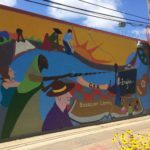 Thanks to the Bezazian Library leadership this historic mural was revitalized. Originally painted with old house paint when colors were limited, the new look flashes a more sparkly smile with rich blues and sharp reds. Enjoy another 40 years! It looks great…it looks like I remember as a kid in the neighborhood. Thanks! 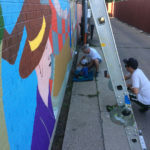 So glad you-like many in the neighborhood-are glad to see it brought back to life.